You need to keep it smooth. Here's how. Every shooter should be aware that they need to swing the gun before, during and after the moment they fire. Stopping the swing is a major fault and will almost certainly result in missing the bird behind. You need to remember what the word swing means. . Swinging the gun should be a single, smooth and rounded action and not a series of jerks. Don’t just try to swing or move your gun alone. The good shooter will swing the gun and turn his body unison. 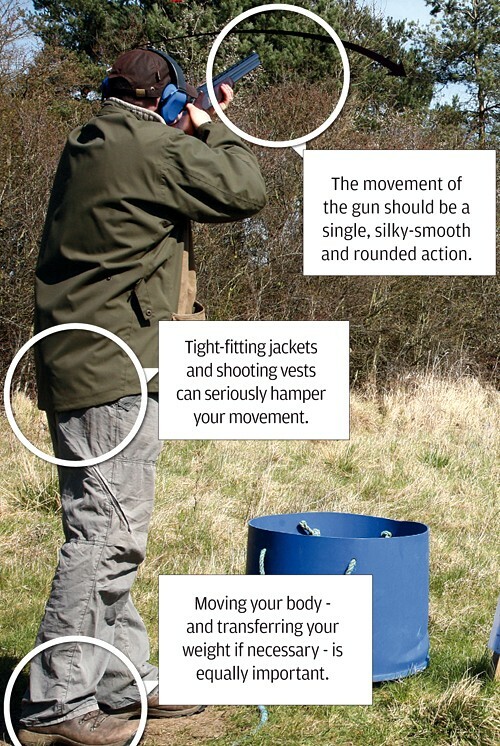 Don’t move the gun independently of your body – it will affect your gun mount. This could mean that you probably miss the bird and get a bruised shoulder/cheek to book. 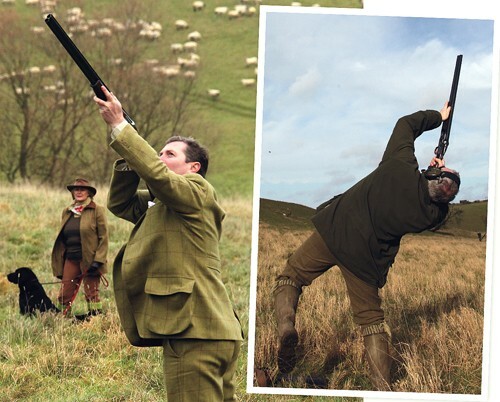 At the end of the swing – after you’ve pulled the trigger and taken your shot – the gun must be mounted exactly as it was at the start of the swing. Otherwise the whole relationship between the gun, your eye and the target will be ruined and you won’t be firing where you think you are. Which mean you will probably miss. For instance, the swing might start at 10 o’clock, when the muzzles are on the bird it’s 12 o’clock and, continuing the swing through the target, the trigger is pulled at half past one. You won’t hit your targets if your stance is wrong. Even if you have a silky smooth swing. For example, if your feet and body are positioned 45° from where they should be on a crosser you’ll find that you physically can’t swing the gun far enough. You’ll end up twisting and dropping your shoulder to compensate and invariably you’ll miss. A good rule of thumb is to have the toe of your front foot pointing towards the intended kill point. Driven birds are a classic example where the shooter often runs out of swing. This generally happens because the shooter leaves it too late before pulling the trigger. The swing stops because there’s nowhere else for the shooter to move the gun. He’s run out of room. Take birds when they’re about 45° to you so the length of the swing (or arc) is manageable. 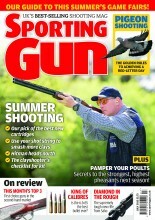 What’s the secret to smooth clay shooting? 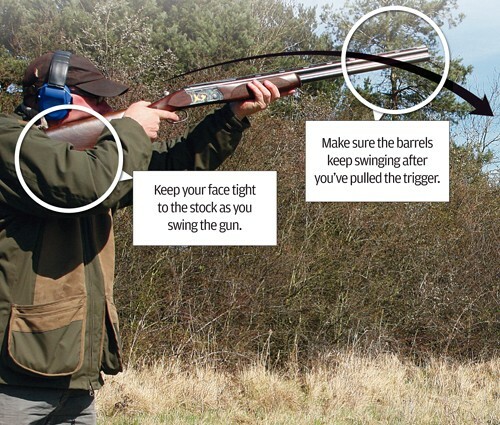 Swinging the gun properly is one of the most important shooting skills. Practice it by spending a few minutes daily dry mounting and swinging the gun at home. Use the line up the corner of your living room, or ceiling, as a guide. Set yourself up properly and practice following the line with the muzzles. It’s actually a lot harder to be consistent than you think – but practice will improve your technique. It might sound obvious but tight-fitting jackets and shooting vests can seriously hamper your swing. So wear clothes that allow you to move freely. The movement of the gun should be a single, silky-smooth and rounded action and not a series of jerks from one position to the next. The perfect swing is not just about moving in the direction in which the muzzles are pointing. Moving your body – and transferring your weight if necessary – is equally important. Don’t just try to swing or move the gun on its own. 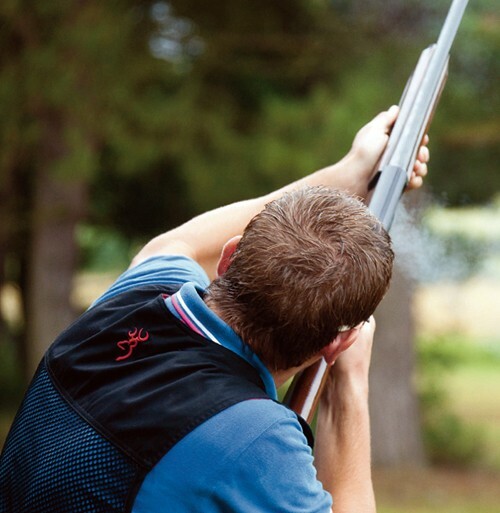 Watch any top shooter in action and you’ll notice that by turning and moving correctly the gun and their body will be as one – in perfect unison. 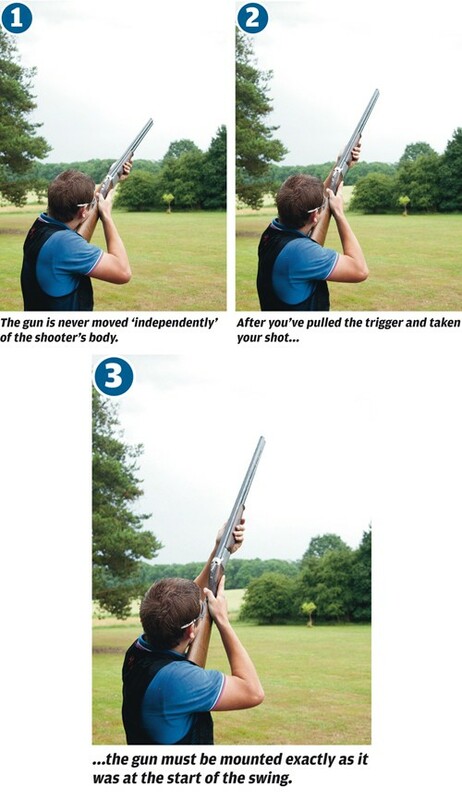 It’s really important that the gun is never moved ‘independently’ of the shooter’s body – if it does you’ll find it will affect the correct mounting of the gun in the shoulder and on the face. At the end of the swing – after you’ve pulled the trigger and taken your shot – that the gun must be mounted exactly as it was at the start of the swing. Don’t stop the swing as you pull the trigger. You must keep the muzzles moving or you’ll probably miss behind.